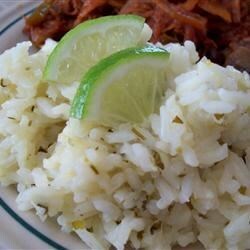 "This rice is great as a side dish or added to your favorite taco salad or burrito. Much like you will find in fresh-Mex restaurants." Blend the onion, green chiles, garlic, and lime juice together in a food processor until smooth; add the cilantro and pulse until the cilantro is finely chopped into the mixture. Bring the water to boil in a saucepan. Stir the cilantro mixture, chicken bouillon granules, salt, butter, and rice into the water and return to a boil; reduce heat to medium-low and cover. Simmer until the rice has absorbed the liquid entirely, about 20 minutes. Lime and cilantro quickly freshens up plain white rice. Pretty good, but not the rice I was hoping for...still searching for the clone of Chipotles! Very tasty! I made this to go with a chicken dish and it was a great compliment: light, but very flavorful. I did leave out the green chiles for my children. This was very easy to prepare. I followed the directions and it came out great. This was nice and light. My young boys loved it. I will make this again.